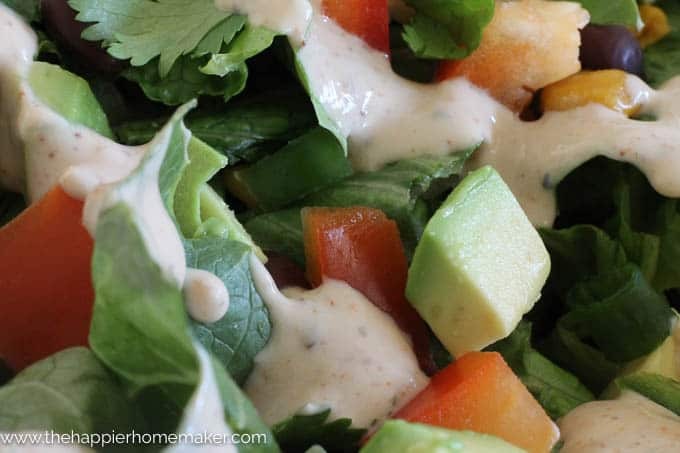 A couple of years ago I was visiting my family and my stepmother had this delicious Southwestern Salad Dressing, unfortunately I’ve never found that particular brand in my grocery stores despite searching high and low. 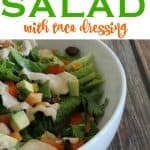 I love anything Mexican inspired so I was forced to experiment and make my own version that I lovingly call “Taco Dressing” and it’s the perfect complement for this easy, hearty Southwest Salad recipe! It’s very easy and fast to toss together-I usually have this for lunch the day after we make Burrito Bowls using the leftovers. It’s filling! 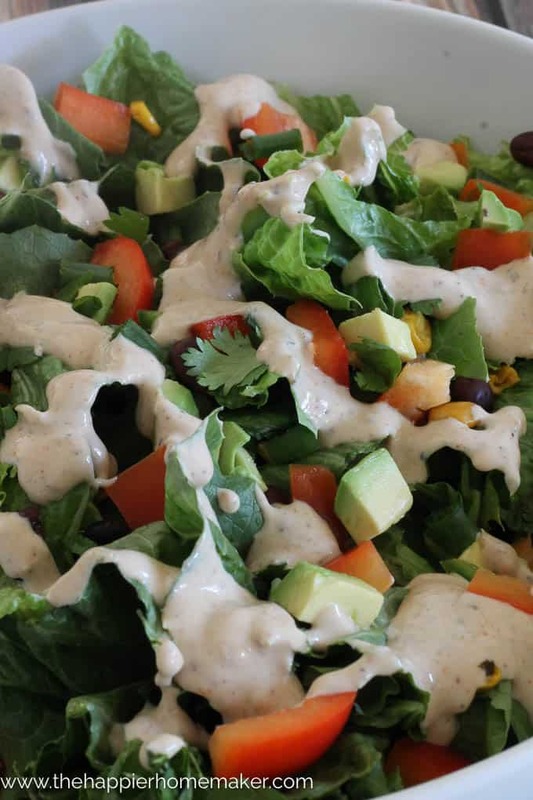 The beans and Greek yogurt in the dressing give protein without a lot of calories and the avocado adds those healthy fats we all need in our diet. It’s flavorful. As I mentioned in yesterday’s post about Mistakes that Sabotage Healthy Eating, eating boring “diet” food is self-torture that usually ends with falling off the wagon or binging. This salad has SO many flavors in it, eat bite is different than the last! It’s delicious and anything but boring! It’s colorful. Not only is this salad pretty to look at (bloggers love “pretty” food!) but the different colored veggies offer a lot of nutrition! It’s easy to customize. I don’t like tomatoes in my salads so you’ll notice there are none here-but if you like ’em go ahead and throw them in! Don’t like the spice? Don’t add the jalepeños! It’s easy to add your favorite veggies or take out anything you don’t like! 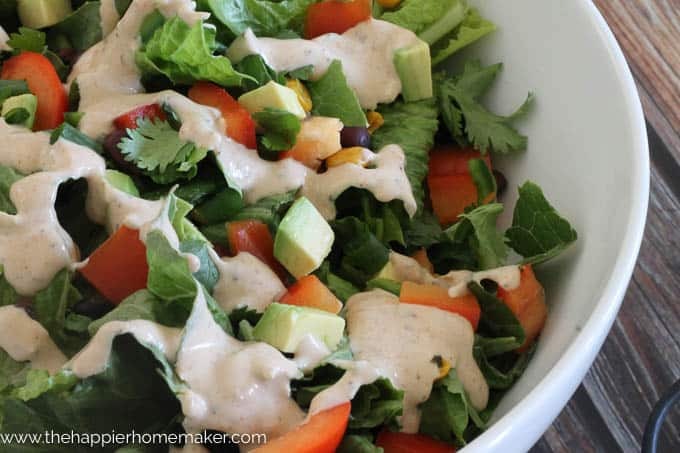 This delicious Southwest Salad is full or flavor, filling, and easy to customize to your taste! 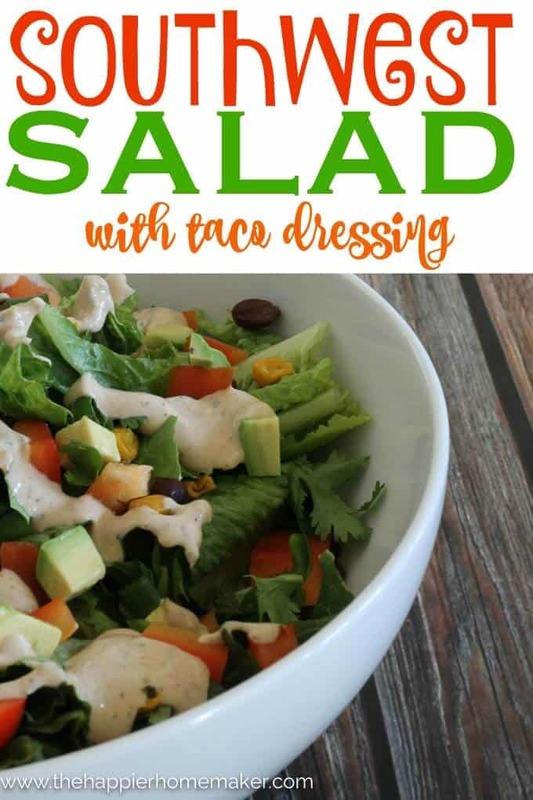 For the dressing, combine yogurt, taco seasoning, and water. Mix until uniform. Chop the romaine, pepper and avocado. Finely dice the jalepeño pepper. Toss all ingredients in a large bowl and top with dressing. I enjoy this site immensely but find it difficult locating & saving recipes.. This sounds so yummy! I cannot wait to give that dressing a try. Thanks! It’s so good Kristen_ actually came up with it when we still lived near you in NC a few years ago and just finally posted it! I enjoy this site immensely but find it difficult locating & saving recipes..no I have never filled this box out before! This was delicious, thanks for sharing!